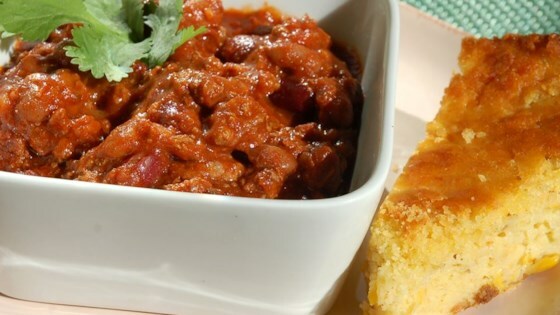 "This is the tastiest, easiest chili recipe you'll ever find. I recommend serving it with sliced jalapeno chile peppers and crackers or cornbread." This may be the easiest chili recipe you ever make. And it's delicious! This was way to tomato-ee & needed cumin to taste like chili -sorry but not a blue ribbon chili for us. Great recipe and easy. I have also added a little brown sugar and a bottle of beer. I also like spice, so added a dash of cayenne. Then let it simmer for an hour or so. I have stopped experimenting with chili recipes after trying this one, it tastes a lot like wendy's chili, but better.